A University of Vermont staff member has vowed to refrain from eating until school administrators answer a list of nine demands seeking racial justice. John Mejia, assistant director of the Office of Student and Community Relations at UVM, has been on a water-only diet since February 16 in solidarity with Black Lives Matter. Spurred by recent incidents of racism on campus, Mejia wrote an open letter to UVM president Tom Sullivan and the City of Burlington calling for UVM to fly a Black Lives Matter flag outside the Davis Center permanently, increase funding for anti-racism events on campus, and triple the staff and operating budget of the Mosaic Center for Students of Color. "How much longer until a white supremacist with an AR-15 comes to campus, buoyed by the complicity of silence and deflection from the white majority, to kill our black family members?" Mejia wrote in the letter. "I, in good conscience, cannot wait for thoughts and prayers and repudiation in the aftermath of such an event." Mejia began the hunger strike two days after a teenager shot and killed 17 people at a Florida high school. Closer to home, Mejia noted several examples of racism on the UVM campus, including the recent pasting of "vile and racist posters" on a display belonging to the Mosaic Center. Anonymous people have posted white supremacist materials at both Champlain and Saint Michael's colleges, too. A UVM group called NoNames for Justice held a Done With the Bullsh*t Rally! on Tuesday to protest the mounting number of incidents and to support Mejia's quest to get results from the university. About 150 people flooded UVM's Waterman Building calling for racial justice on campus and for three school administrators to resign. 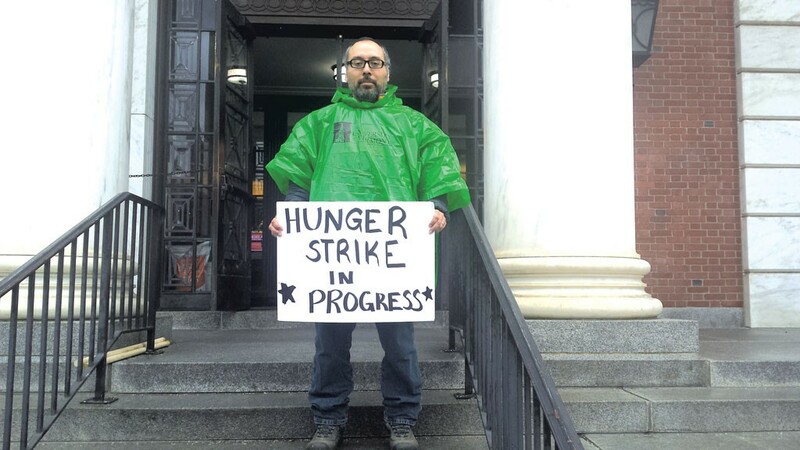 Said Mejia: "I will be on hunger strike until UVM and the city meet my demands, or I perish." A group University of Vermont student protesters spent much of Monday occupying the Waterman Building, where leaders met with school deans and even university president Tom Sullivan to discuss the group's demands related to racial justice on campus.